United Cutlery Swords are available in assorted styles. Officially Licensed movie swords including the Lord of the Rings and The Hobbit Movie Swords are available. 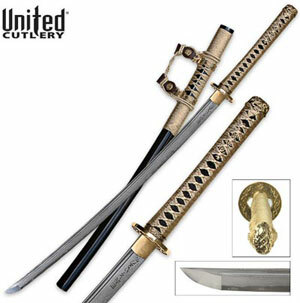 Additionally, United Black offers functional Samurai Swords and Tachi Swords. The blade tang has an exclusive stamp that can only be found on a United Black sword blade. United Cutlery Swords for sale include the popular Gold Kogane Dynasty Tachi. These Tachi swords from the United Cutlery Black Collection measure 42 inches overall. United Cutlery crafted the 30 inch blade of forged Damascus steel. The functional Damascus steel blade is heat forged and folded nine times to create 1792 layers. This process results in eye-catching designs on the sharpened blade. The blade features laser engravings that translate from Japanese to United Strong Steel. The hardwood handle offers authentic ray skin with a traditional cord wrapping. The custom leather wrap is accented with stunning brass menuki. These handsome Japanese Tachi swords include a hardwood scabbard that coordinates with the handle. Buy the Gold Kogane Dynasty Forged Damascus Tachi swords produced by United Cutlery for a piece that offers functional beauty with modern day construction for $169.99.